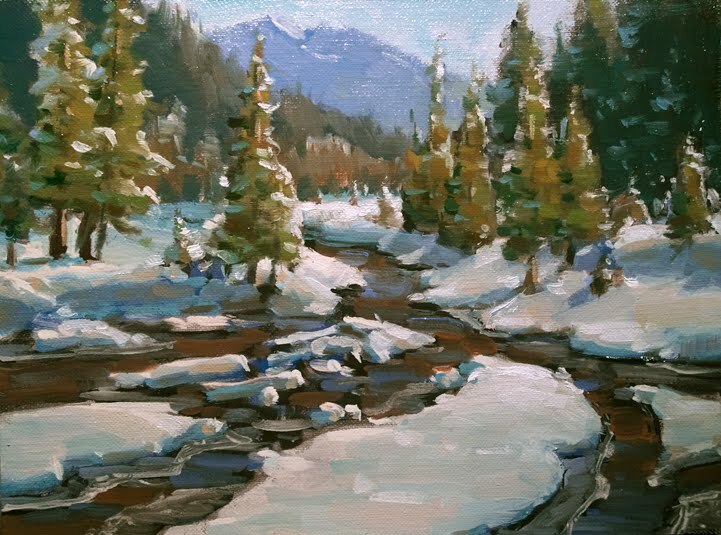 Painting backlit snow is very difficult, as I discovered today. It is troublesome to judge color or value when one is looking into something so bright. I think I have exhausted this subject for a while, and will try something else tomorrow. 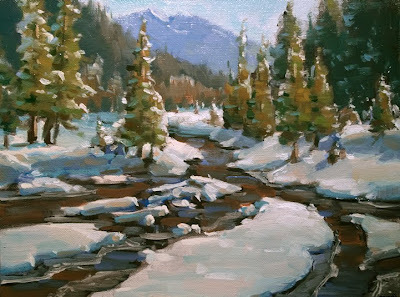 The ice was cracking all around me as I was painting this, but I managed to stay dry. This view is looking the opposite direction from the one I painted yesterday. The colors look better in person than they do here on this post. Overall, it was a magical day, yesterday's heavy fog combined with a zero Fahrenheit overnight temperature creating a thick flocking on everything in the valley. A very gentle breeze blew the crystals into the air where they seemed to hover and sparkle like diamonds in the sunshine against the deep blue sky. It was very Doctor Zhivago. Study 6x8 oil on linen. Sharon, I look forward to seeing your work each day. Wonderful paintings and your thoughts make for an interesting blog. I think this backlit snow is my favorite (so far) this trip. Interesting observations. I will take them to account next time I'm out in the snow.